This 4 week course has been specially designed to give beginners a real experience of different aspects of yoga. Over the 4 weeks you will be taken on a journey to explore meditation, relaxation, asana (postures and movement) as well as a look into the philosophy of yoga and why it’s so incredible. Each session is 90 minutes long and although they are all interlinked each week will have a different theme and a different focus, allowing you to explore and experience the benefits for yourself. As part of the course, you will receive a 15 minute personal consultation where you can discuss with the teacher what you hope to achieve from the course, any pre-existing injuries or conditions you may have and the teacher may offer you specific guidance or personal modifications for you. At the end of the course you have the opportunity to book a half-price 90-minute private yoga class. This gives you the opportunity to explore in further depth anything you have experienced in the course. Brilliant course for beginners like me, but be careful or you might become hooked on yoga! An introduction into yoga asana (postures) – we will practice sun salutations and look at how to modify so you get the best yoga practice for your body. Flowing through some standing and seated postures. Savasana – we will then finish the first week with a lovely long relaxation and gain an understanding of the importance of relaxing at the end of the yoga class. I really enjoyed the course. Zoe made us all feel very welcome and offered support and encouragement whatever our level of ability. 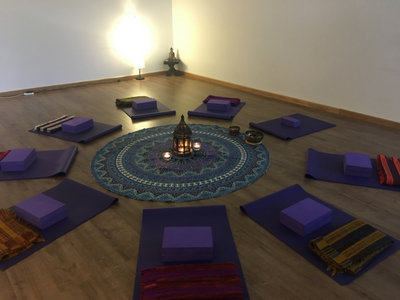 The yoga studio was lovely, very thoughtfully furnished and equipped with everything you could possibly need – I particularly liked the blankets and the lavender eye masks!